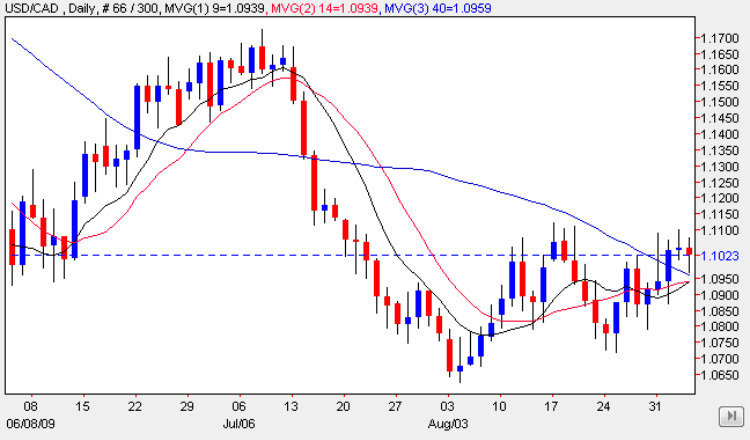 The usd to cad daily chart is once again delicately balanced as the forex pair try to recover and rally higher, following the steep falls of the summer months, with yesterday’s candle making a brave attempt to find some support in an effort to push higher once again, but ending the forex trading session with a small body and deep lower wick. The low of the day did manage to find some support from the three moving averages , but as they are now tightly bunched are providing little in the way of any meaningful technical analysis. However, and perhaps of more significance, are the attempts to breach the 1.11 price level where we have seen six failures in the last few weeks. Should this level fail to be breached, which is combined with some deep resistance, then we can assume that the usd to cad pair will move lower in due course once again, to re-test the support now in place at the 1.065 price level. The main item of fundamental news for Canada today is the unemployment data, which is of course mirrored in the US with the monthly circus of the Non Farm Payroll so a lively couple of hours are in prospect on the usd to cad today. The Ivey PMI report is due out 90 minutes after the release of the NFP figures, but may well get drowned out in the ensuing cacophony and volatility that always follows the NFP data. With both the US and Canadian markets closed on Monday for a national holiday, we may have to wait for later in the week to see where the usd to cad is heading in the medium term, and the above numbers may provide a catalyst for the pair to break out of the current consolidation range and to set a new trend moving forwards into the last third of the year.